 Black Maple (Acer nigrum) - droopy leaves. 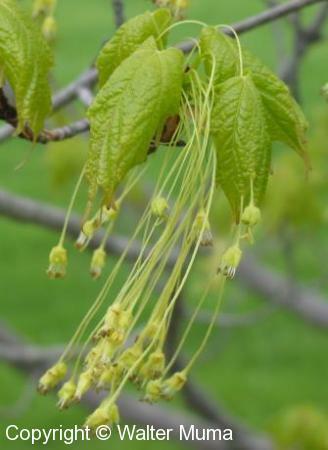  Norway Maple (Acer platanoides) - leaf stalks exude milky sap when broken.  Red Maple (Acer rubrum) - leaves are more toothed. Notes: These are the famous "maple syrup" trees. A Sugar Maple leaf graces the Canadian flag. Photographs: 239 photographs available, of which 6 are featured on this page. SCROLL DOWN FOR PHOTOGRAPHS. Here is a very old Sugar Maple tree, probably more than 100 years old. 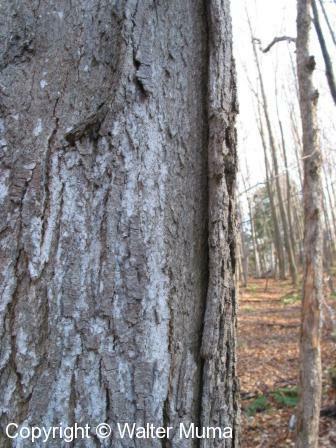 The bark of Sugar Maple is distinctive in that it peels into thick vertical strips, attached at one side, lifting free on the other. This is the trunk of that ancient Sugar Maple pictured at the top of this page. Norway Maple leaves are very similar to Sugar Maple. Many tree ID beginners get the two trees mixed up. Here they are pictured together for comparison. The Sugar Maple leaf is on the bottom. Note that the Norway Maple leaf has more points. The quick and easy way to tell them apart is that Norway Maple have milky sap. This is easily seen by breaking a leaf stalk.